Note: The Tap feature is only available if you have an Office 365 Subscription and is now only available to customers who have one of these Office 365 SKUs: Business Premium, Enterprise E3, or Enterprise E5. Also note that the Tap feature is not yet available for Office 365 subscriptions generated in Australia, Brazil, Canada, China, Germany, Great Britain, India, and Japan; regardless of the country you’re working in. We are working on expanding Tap’s availability to these locations in the near term. If you'd like to find and reuse content used by you and your team in your working document or email, use the Tap feature in Word 2016 or Outlook 2016. Tap is also available in Outlook. 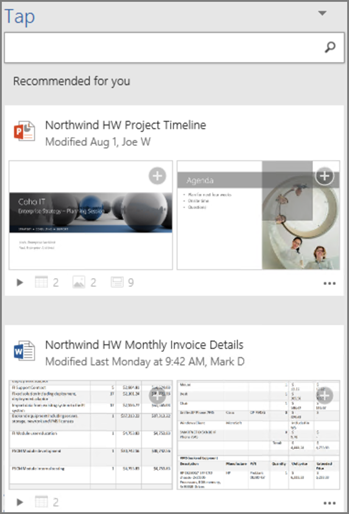 Tap for Outlook gives you the ability to access relevant documents within the email workflow and allows you to pull in content from those documents right into your email for easy sharing, without having to attach the entire file. Note: Tap uses Office 365 graph to query the content you and your team use from Office 365 applications and display it in the tap pane. Tip: Click on the headings below to see the instructions. On the Insert tab, in the Tap group, choose Document Item. The Tap pane shows a list of content used by you and your team from the Office applications (Word, Excel, PowerPoint) you have seen before. Go to step 4 if you see the content you want to reuse in the tap pane. If you want to see specific content - in the search box, type a keyword for the content you are looking and press Enter. The Tap pane shows a list of content recommendations for the keyword from the Office applications (Word, Excel, PowerPoint). There is a small legend at the bottom of each document displayed in the Tap pane. The legend represents the actual number of objects, pictures, SmartArts, tables, charts, or slides that are present in each document. 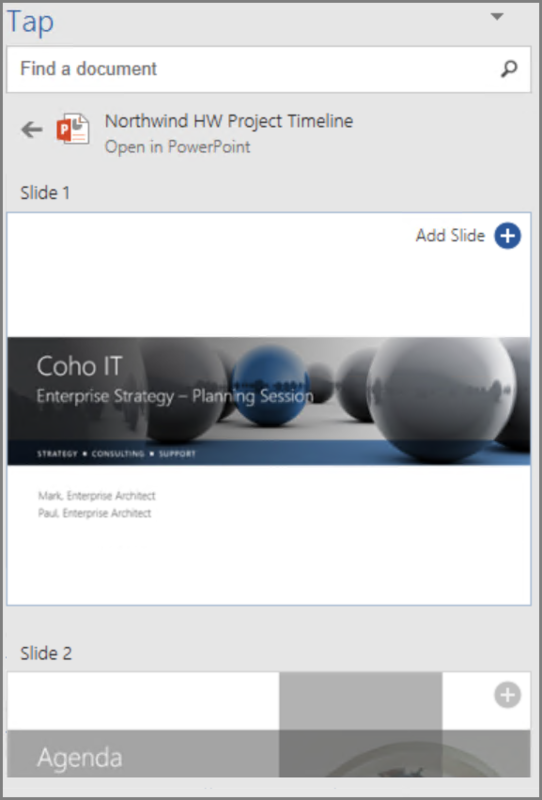 Application can be an Office application like PowerPoint, Word or Excel. View all items displays all the content that can be reused for the selected document in the Tap pane. 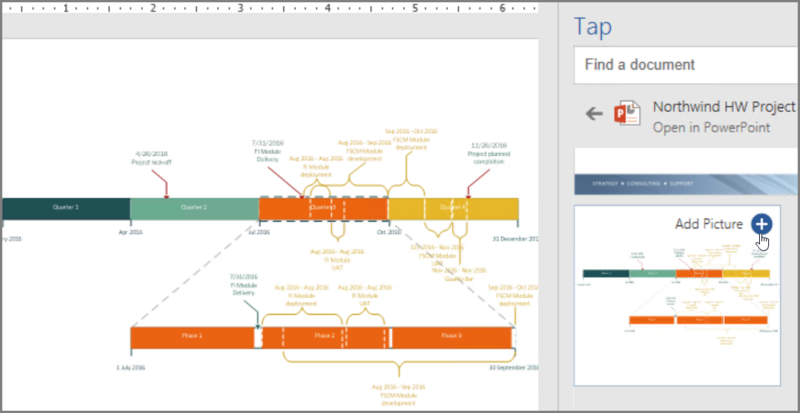 You can select any result in the Tap pane to view the content in detail for reuse in your working document. Choose on any SmartArt, object, picture, graph, chart, table or slide to add it to your working document. Note: You can also use Tap from the right-click context menu. Right-click on a potential keyword you want to use for search and select Insert Document Item to bring up the content recommendations on the Tap pane. You now have a document that was created by finding and reusing content from across your team all within Word. Format the image, graph, table or chart that you inserted or Use Word Layout options to move pictures. On the Home tab, in the New group, choose New Email. A new message window is displayed. If you want to insert any content you or your team has used into your email, choose Insert tab, select Document Item. Tap searches and recommends personalized content from Word, Excel and PowerPoint applications and displays it in the tap pane. Simply hover over any result in the tap pane and choose to insert and re-use content in your email. This opens the selected document in application such as PowerPoint, Excel, Word. View all items displays all the content that can be reused in the selected document in the Tap pane. Choose on any smart art, object, picture, graph, chart, table or slide to add it to your email.